Many Bretons, over time, have left their part of the country to set sail and explore the world. However, this mustn't be mistaken for a wish to escape their region; on the contrary, they are proud of their identity. The Bretons have a certain openness to the world and through travelling, they seek adventure. This has been so since the Breton sailor's reputation for navigational talents became a well-known fact. Breton sailors know just what navigating along the ragged Breton coasts and the stormy islands of Ouessant, Sein, Molène and Groix entails. The great sailors of French history are often from Brittany; from Jacques Cartier to Eric Tabarly, to Surcouf and Duguay-Trouin. It just goes to show that this nation knows a thing or two about travelling and are excellent at welcoming travellers! Bretons love to offer hospitality as much as receive it. A bowl of cider, buckwheat galettes (pancakes), andouille sausage from Guémené, oysters from Cancale, kouign aman, a dish of seafood, and a glass of beer...you can't help thinking how pleasant it is to be welcomed to a region where the locals like to eat well. In terms of the sea, Brittany is rich. Generous, with a strong character, maritime Brittany is a succession of landscapes where the land and the sea appear, by turns, to be in harmony with one another, and engaged in bitter conflict. 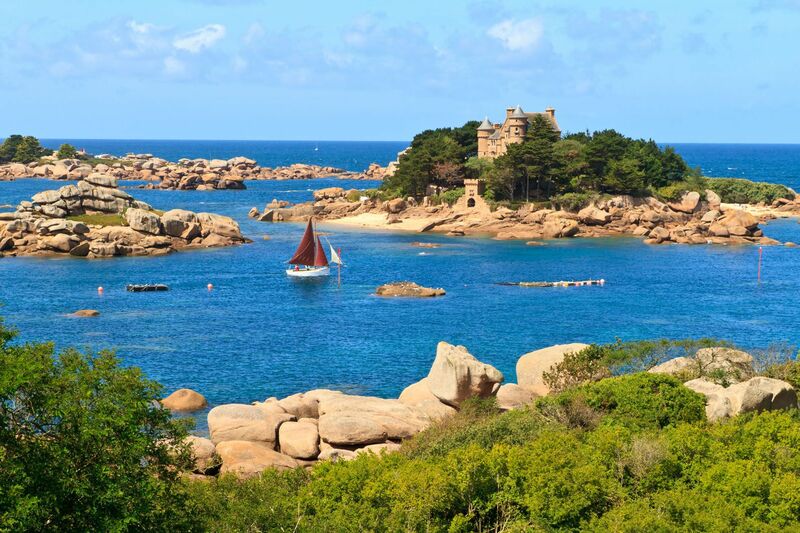 The result of this turbulent relationship is an indent of coasts, each one more beautiful and wild than the one before it: côte d'Emeraude (Emerald coast), côte de granit Rose (Rose granite coast), côte d'Amour (The Love coast), or côte Sauvage (Wild coast). The blue of the sea often makes way for the green of the forests, which are well-known for their legends. You only have to take a few steps into the Brocéliande Forest to enter into the world of Merlin the Enchanter, and Arthur and his Knights of the Round Table, in Huelgoat Forest with all its rocks and hundred year-old trees. At nightfall, Korrigans (Breton goblins) sometimes escape and head for the Monts d'Arrée (an ancient mountain range), dancing the farandole all the while. An historic Brittany can also be observed with its megalithic stone alignments (in Carnac), its fortified cities (Saint-Malo, Concarneau), its city centres with half-timbered housing (Vannes), its Parliament (Rennes) and its numerous wayside crosses, churches and other religious sites. When visiting Brittany, one will realise that music is an intrinsic part of life here. 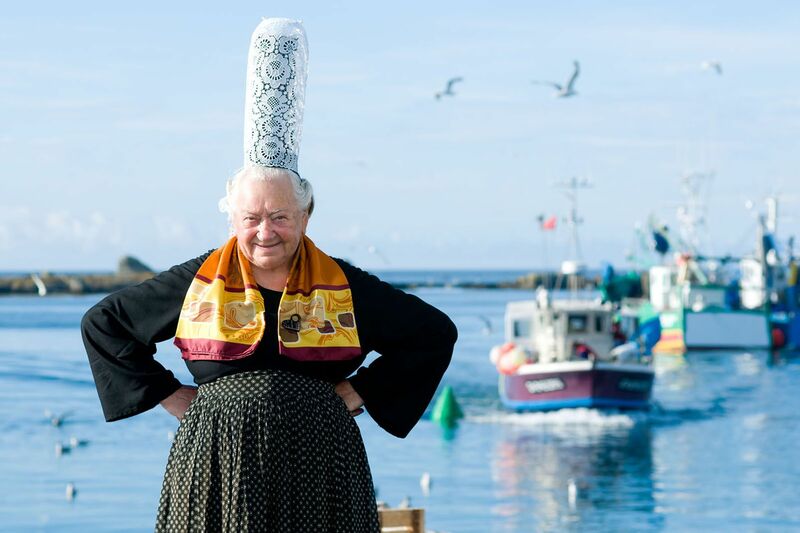 Bignous (Breton bagpipes), violins and bagads (Breton brass bands) form the base of Breton's musical culture, which animates festivals in cities like Saint-Malo, Rennes, Brest, Dinard, Quimper and Vannes. Galettes are different from French crêpes, as buckwheat is used to make them and they are eaten savoury, whereas crêpes are made with wheat flour and are sweet. The galette is a staple food which can be eaten with almost anthing inside it. The 'galette complète' is traditionally made with egg, ham and cheese, but numerous other ingredients can be added to them or replace them such as andouille sausage, smoked bacon, goat's cheese, salmon, tomatoes etc. Europeans have been enjoying Crêpes since the fourteeth century. A text, dating back to 1390 mentions the recipe of the famous crêpes made with wheat flour, egg, salt, water and wine. The wheat-flour based crêpe is eaten sweet, just like we would eat pancakes in the UK. Crêpes can be eaten with jam, sugar, salted butter, maple syrup, or salted butter fudge, etc. Brittany is renowned for its maritime tradition and is the leading fishing region in France. The abundance of sea products allows for a rich and varied gastronomy. Visitors here are spoiled for choice! From fresh scampi and lobsters from Finistère, scallop and cuttlefish from Saint-Brieuc and Saint-Malo, spider crabs from Paimpol, crab from Morlaix, and even clams, whelks and winkles, you'll have difficulty choosing what to taste first! Among these products, two regional delicacies which must not be overlooked are oysters and mussels. There are 12 'Grand Crus', or specialities, in Brittany. The most well-known are the 'morlaisienne' for its tender flesh, the iodised and fleshy 'paimpolaise', the 'creuse' from Cancale, the hazelnut flavored ?plate' from Bélon and the 'fine de claire'. The main type of mussel breeding in Brittany is the 'bouchot'. An alignment of oak wood stakes measuring between 13 ft and 19 ft high forms the beds the mussels are bred in. The mussel farming centres are located in the Bay of Saint-Brieuc, Saint-Cast-Le-Guildo and Paimpol. This abundance in variety enables restaurant owners to offer a host of delicious recipes, such as Breton spider crabs, Armorican lobster, and seafood omelettes. Waiting for the fishermen's return and choosing your fish at an auction is one of the many pleasures that Brittany has to offer. This morning outing will make you realise how rich the waters surrounding Brittany really are. Mackerel, sardines, hake, monkfish, tuna, sole, red mullet or turbot, whether used as the basis of an elaborate recipe (cotriade, a sort of local bouillabaisse [fish soup], daurade à la Brestoise, seafood choucroute) or cooked, more simply, in butter the fish will not fail to deliver an array of fresh flavours. The meat in Brittany seems to be a lot less diverse than its water-bred counterparts. However, due to the traditional breeding of pork in particular, the choice remains quite wide, this local product serves as the basis for numerous cold cooked specialties: pâté, rillettes, saucisson, black pudding and tripe. Some other specialities that should not be snubbed are pre-salted lamb from Mont Saint-Michel, the 'poule coucou' from Rennes, and the andouille sausage from Guémené (smoked and soft). Due to the market garden areas which produce fruit and vegetables of high quality, Brittany is one of the leading French agricultural regions. The Saint-Méloir area, which is very fertile, is reputed for its garlic, carrots and asparagus. That of the 'golden belt' in Léonard, with its great market garden tradition, produces Roscoff pink onions, cauliflower, artichoke and Iroise potatoes. This is the traditional recipe of the Breton peasants. The recipe is simple, and composed of cut up vegetables, pieces of pork meat and 'far' dough. The particularity of this dish lies in the fact that the dough is placed into a cloth sack and plunged into water to conserve its consistency. 'Far' is a sort of pancake dough flavoured with cider from grape skins and cinnamon, cooked in an oven dish. You can add raisins or apricots to it. However, authentic 'Far Breton' is made with prunes. This butter-based, compact cake can be conserved for weeks. It can also be eaten with jam or chocolate. Flour, butter and sugar, that's all you need to make the king of Breton desserts. It is not very healthy of course, but that doesn't make it any less of a delight for your taste buds! To make the Kouign Aman, however, is far from easy. It almost entirely depends on the way in which you fold the dough to obtain the puff pastry layers. Beer: although the cervoise, its ancestor, is supposed to have a very bitter taste, this is no longer the case for the beer today. For centuries, Brittany has cherished this drink, and these days many houses are producing their own beers, like the Brasserie des Deux Rivières at Morlaix which draws up its beer (la Coreff) by hand and not under pressure. Cider is the most celebrated of Breton drinks. Whether dry (the most alcoholic), half-dry, near dry (ideal for crêpes) or sweet, cider is the ideal companion for crêpe parties and typical Breton meals. The most renowned drink of all comes from Fouesnant. Known as the drink of the Gods and the God of all alcohols. Made from honey, this sweet drink is as much a pre-dinner drink as an after-dinner one. Although sweet and voluptuous, it is to be consumed with moderation, or don't expect to be standing up very long! Find weekly weather forecasts for Brittany . Different criteria make it possible to predict with precision the best time of year to go to Brittany . A comprehensive weather score, made up of temperature indicators, bad weather predictions, sunshine levels and wind speeds, will allow you to choose the activities best suited to the weather conditions and therefore make the most of your holiday in Brittany .